Today we are very excited to present our first commissioned map for Aereon - Dragonsmouth! This map was commissioned from the very talented french cartographer Maxime Plasse (aka - Max - on Cartographers' Guild forums), who will also be working on several more maps for the setting. Dragonsmouth was originally built as a military outpost by the Thulian Technocracy to protect and make use of a strategically important Waygate that was found in a series of caves under a large outcropping of rock (now called Dragoncrest) in the Northern Borderlands beyond the borders of Thule and Britannia. To protect the outpost inhabitants from the Mists, a large domed design supported by the rock outcropping was adopted. Unfortunately the project was plagued by problems and constant Mistspawn attacks. This accumulated to the collapse of the dome during mid-construction just before the end of the war between Thule and Britannia. Already struggling under the costs of the continuing war effort, the government abandoned the project and ordered all troops to pull out. However, those already living in the settlement refused to leave, as did General Herrera, the military commander in charge of the project, who made it his duty to look after those left behind by Thule. His men, the Grey Guard, likewise stayed behind, becoming the standing military force for the city. Thus Dragonsmouth was born, named after the shape the broken dome made. Some fifteen years on the city has grown, quickly becoming a centre of trade for the northern borderlands, with a reputation as a place where you could pretty much find anything - for a price of course. It is also a well-known refuge for certain people (criminals, mercenaries, pirates and the likes) that wish to avoid the forces of Thule and Britannia. Dragonsmouth also has a strong industrial sector, with local mines providing the necessary raw materials for the production of steel from which other goods are manufactured. However, due to the harsh, barren and rocky land around the city, it relies heavily on other settlements around the region to supply enough foodstuffs to feed its people. 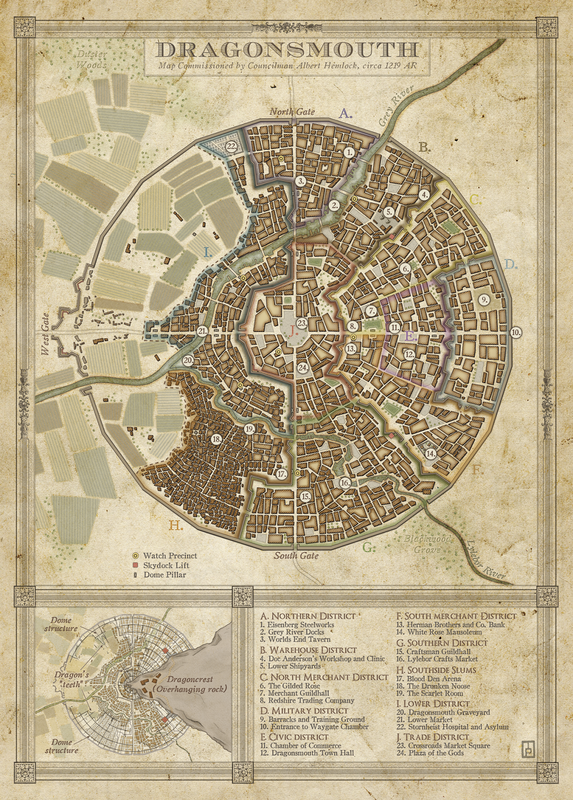 Dragonmouth is just one of many cities that will be presenting in the upcoming Eternity: Steel and Steam campaign setting book, due to be kick started early 2014!